Reimagining classic pieces of literature for a modern setting certainly isn't a new concept, but they're rarely as on-the-nose and self-referential as Gemma Bovery, the latest from Coco Before Chanel director Anne Fontaine. Based on the comic series from Posy Simmonds -- later published as a full graphic novel -- the story explores a surreal blend of reality and fiction in its depiction of a beautiful young woman whose name marginally differs from the protagonist of Gustave Flaubert's novel "Madame Bovary", touching on the same issues of domestic dissatisfaction and yearning for passion experienced by the book's character. As an aging baker observes and interferes with how she walks in Bovary's footsteps, her downfall into the same turmoil of Flaubert's prose take shape through the film's lukewarm, quasi-dreamlike tone and shady dependence on coincidences. What results is a vague, ponderous affair that's only salvaged by the quietly passionate and melancholy substance of Gemma Arterton's performance. Bucolic warmth and textures juxtaposed with the shadowy coolness of interior and overcast moods are what give Gemma Bovery its aesthetic flavor, presented in a fine but unremarkable 2.35:1-framed, 16x9 transfer. The sun-touched atmosphere of the French countryside allows a lot of bright light to accentuate the greens of foliage, the tans and yellows of buildings, and the subtle haze of diffused lighting reaching interiors. Conversely, the shadows and quasi-depressive lack of saturation in indoor shots are capable represented by stable contrast and delicate blues and tans. Baked bread, woven hats, tendrils of hair, and the weathered walls of the Bovery household lure pleasing fine textures out of the cinematography, while skin tones are appropriately warm or pinkish depending on the light source. The image does seem somewhat dim at times, yet that doesn't stop certain black levels from appearing too light, and general sharpness wavers in many shots. All quite palatable, though. Complexity isn't really on the menu for this 5.1 Dolby Digital track for Gemma Bovery, sporting only a few sparse effects within its indie-drama sound design, one that's far more concerned with dialogue stability and subtle ambience. Narration is persistent throughout the film, which commands a robust middle-range tenor without any distortion and a moderate amount of lower-frequency response. Similarly, musical elements are just as clear and adjusted to silence in the background, responsible for the bulk of the track's surround design as instruments and vocals -- including a few poppy tunes -- keep up a clear and vibrant presence. Other sound elements are reduced to little things like the echoes of an old house, the motion of driving cars, and buzzing bugs, which are well-attuned and clear. The English subtitles are expertly translated and coherent. 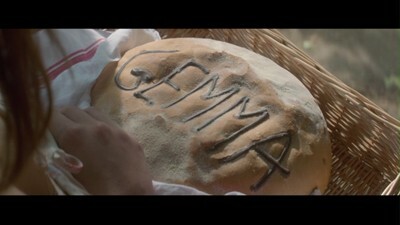 Music Box Films have included a nice arrangement of extras for Gemma Bovery, led by In the Footsteps of Emma: The Making of Gemma Bovery (21:24, 16x9), a traditional interview and behind-the-scenes featurette with a nice twist. Director Anne Fontaine and Gemma Arterton lead the way in their recollection of getting the film up and running, enlightening on why Fontaine's films appeal to women, Arterton's prior experience with the French language, and how crucial Fabrice Luchini's character interlocks with the narrative. Later, some page-to-screen comparisons and behind-the-scenes footage also emerge organically in their chats, which are mostly in French with English subtitles (the English bits have French subs). 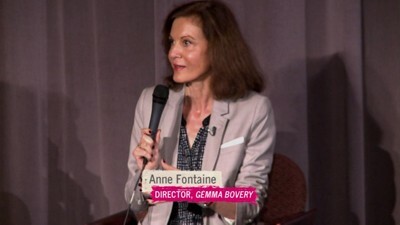 Master Class with Anne Fontaine (22:1, 16x9) is, actually, a pretty apt description of the feature, transforming a moderated Q&A format into a fine commentary about the director's composition, inspiration, working with accents and retaining a specific mood. Also included is a brief arrangement of comparisons between the hand-drawn artwork from the graphic novel and the scenes from the film, entitled From Page to Screen (3:01, 16x9), as well as an explicit Graphic Novel Gallery featuring 32 slides of artwork from the publication. Finally, a Theatrical Trailer (1:46, 16x9) has been included. Despite a radiant, gloomily sultry Gemma Arterton and a decidedly creative reinterpretation of Gustave Flaubert's famous novel in the French countryside, Anne Fontaine misses the mark with Gemma Bovery's quixotic blend of romantic comedy and tragic drama. Part of the problem lies in the literal and harped-upon duplication of the book's plot developments, cutely disguised with a sentiment of life imitating art, but it also has to do with the overly obsessive tenor of her aging admirer Martin and the prevalence of rickety contrivances forcing things to happen in the story. The result, after a dubiously downhearted ending, is a heavy emotional backdrop for Arterton's talents that drops the loaf where it really counts. Rent It.